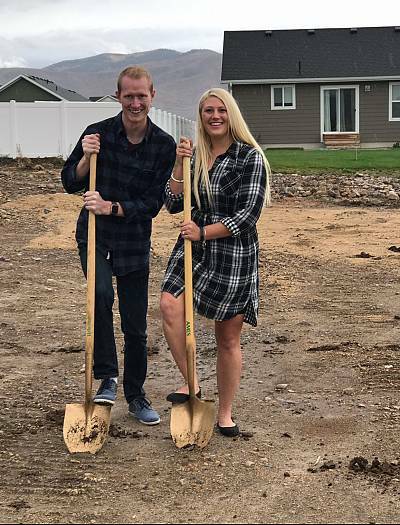 Scott and La Tysha Mitchell couldn't find a house they could afford to buy, so they decided to build one with their bare hands in rural Utah, using a loan from the Department of Agriculture. 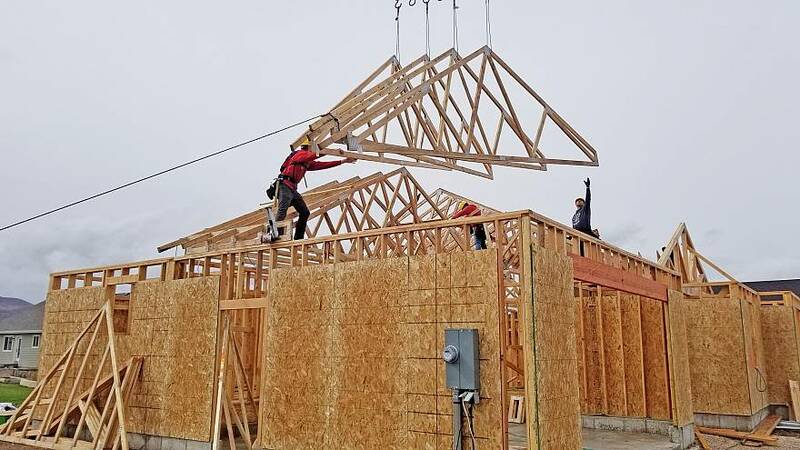 They've been toiling outside through the snow and 4-degree days, installing flooring and putting up roof trusses for their future home in Utah's Heber City. But now the government shutdown could jeopardize the hard work they've poured into the project, threatening not only to stall construction but also to saddle them with bills from contractors and suppliers who aren't being paid. "We would be absolutely devastated — we've made so much progress, we've had so much momentum," said Scott Mitchell, 26, who works for his family's video production company and whose wife works as a spa attendant and receptionist, together earning about $40,000 a year. "It would hurt a lot." The Mitchells are working with Self-Help Homes, a Utah-based nonprofit that pays for construction materials and subcontractors on their behalf, with the expectation that the USDA will reimburse that money through the federal loan of about $324,000 that the couple has taken out. But since the partial government shutdown began on Dec. 22, the nonprofit hasn't received any funds from the USDA and is rapidly running through its reserves. If the shutdown drags on, the Mitchells risk being on the hook for tens of thousands of dollars — and could even risk losing their partly built home. The Mitchells are among the hundreds of thousands of families in rural America whose homes and prospective homes are being threatened by the closure of the USDA. The agency's rural affordable housing programs have a low profile inside the USDA even when the government is fully operational. Now they have fallen by the wayside as a skeletal staff has struggled to keep the USDA's core initiatives afloat since the partial government shutdown began. And that staff has offered little or no communication about the status of the housing programs, according to interviews with more than a dozen housing advocates, landlords and homeowners. "It's been silence. Crickets," said David Lipsetz, a former USDA official under President Barack Obama who is now CEO of the Housing Assistance Council, which works to fund and develop rural nonprofits. "They're not answering the questions and putting out the information." USDA did not respond to requests for comment from NBC News. The shutdown has halted federal lending for low-income people who can't access traditional financing, placing tens of thousands of prospective homebuyers in limbo. It's also squeezing a rental assistance program that provides housing subsidies for 270,000 families. Landlords who rely on these subsidies to cover their day-to-day operating costs have already reported payment delays and worry whether the money will ever come in. Nonprofit groups that help the USDA house rural Americans say they are already feeling the pinch. The Mitchells are part of a program called Mutual Self-Help Housing, in which families put in sweat equity to build their own homes, using loans from the USDA to pay for the land, suppliers and subcontractors. Self-Help Homes — which is overseeing the construction of the Mitchell's home and 36 others in Utah — says that the USDA has missed about $960,000 in payments to cover these families' building costs since the shutdown began. Self-Help Homes has been covering the bills for the families since the shutdown began, but it is running out of reserves this week, according to Brad Bishop, the group's executive director. Bishop is now working to secure alternative financing to protect the families financially and keep the construction going, but he said things could get ugly if the shutdown drags on. "Subcontractors who are not going to get paid are not going to continue the work, and it's going to look like the recession all over again," Bishop said. "Homes half built, sitting there, and families will be liable for a loan for a home they can't finish." Families in the Self-Help Housing program could also face liens on their property from contractors and suppliers if they can't cover the construction costs, which the USDA reimburses after the work is done. That could damage the families' credit and put them under greater financial strain, said Tom Collishaw, president and CEO of Self-Help Enterprises in California. His nonprofit may have to shoulder a $700,000 bill to protect 70 families building homes through the program if the USDA funding does not come through in late January, he said. The shutdown is also threatening low-income families across rural America who rely on rental housing subsidies from the USDA, a program that mirrors HUD's Section 8 rental assistance in urban areas. In Arkansas, one landlord has already warned more than 1,000 tenants to prepare for the worst, telling them in a letter last week that their rental assistance "is not being paid" because of the shutdown and that they would be responsible for the full amount or face eviction. "Your complex is not in the business of furnishing free rent," said the Jan. 11 letter from Annette Cowen of ASC Property Management, first reportedby a local ABC News affiliate. "As of now, you have no rental assistance and your rent must be paid prior to January 20th or eviction proceedings may began [sic] against you." On Tuesday, after news of the letter broke, ASC Property Management received notification from the USDA that its January rental assistance had been approved. But the company still hasn't been able to communicate directly with anyone at the agency and isn't confident that the funds will come through. "That doesn't mean we will get paid," said Wade Williams, a realtor who works for ASC Property Management, explaining that the properties are meant to "break even" and needed the USDA subsidies to pay for water, sewer and garbage services. "No one is there, no one in our state is working, no one in our area is working. There is no one we can talk to." Williams could not provide an exact number of affected tenants, explaining that not all of them received USDA rental assistance. But he stressed that his company's goal was not to kick tenants out of their homes. "We don't want to evict anyone, but we want tenants to be aware that if this goes on for another two to three months, there are real financial consequences," Williams said. "It's affecting more than just employees in airport security — it's affecting the elderly, handicapped and disabled." Despite the rising anxiety and mounting consequences of the shutdown, the USDA has put out even less guidance than other affected federal agencies, housing advocates say. Unlike HUD, for instance, the USDA has not issued detailed public statements or widely distributed notices to landlords, according to interviews with community housing groups and property managers across the country. Housing advocates say the affected programs are a vital lifeline for rural communities, where access to financing is often limited and rental options are scarce. "These are really poor communities," said Diane Yentel, president and CEO of the National Low Income Housing Coalition, an affordable housing advocacy group. The unsubsidized housing that's available to low-income residents "is often very old or in severe disrepair," she added. According to the Housing Assistance Council, the USDA guaranteed more than 115,000 home loans to low- and moderate-income families in 2018. It also made nearly 7,200 direct home loans to low-income families, who must be living "without decent, safe and sanitary housing" to qualify. The agency issued a shutdown plan in advance of the partial government shutdown, which is the longest in U.S. history, broadly explaining some of the harms to its rural housing programs. "Borrowers would not be able to secure much-needed loans, make loan payments, or reamortize loans," the plan said. "Rental Assistance tenants could be negatively impacted because rent payments would not be processed." But since the shutdown began, participants in the rural housing programs, as well as advocates who work closely with the agency's employees, say the USDA has been virtually silent, providing little information about what borrowers, tenants, landlords and other housing service providers should expect or what actions they should take, and no public estimates about the number of people affected. A Dec. 28 updateabout the agency's activities only stated that it would not be providing "new rural development loans and grants for housing, community facilities, utilities and businesses," but gave no details about existing loans and grants. "USDA has been a black box, and a lot of us are trying to nail down details," Yentel said. She has tried to get a list of properties whose USDA contracts have expired during the shutdown, but "none of us know where those properties are and whether USDA has been in contact with the owners." Patrick Patterson, president of Viridian Management, which manages about 2,500 USDA-funded units in Oregon, Washington and Idaho, has also been unable to get information from the agency. "Our properties are currently owed $900,000 in rental assistance for January and there is NO communication from them," Patterson wrote in an email to NBC News last week. "When you email, you get an out-of-office reply and nobody is responding to anything," Patterson said. "While the shutdown is causing issues with HUD, they are at least communicating with us and appear to be trying work through the issues." Patterson finally received a delayed indication from the USDA on Tuesday that it was processing his payment for the month. But like other landlords, he's not certain that he will actually receive the money. "We're all crossing our fingers that it will be resolved this month before anything catastrophic happens," he said of the shutdown. On Wednesday morning, the Agriculture Department announcedthat its Farm Service Agency would temporarily reopen its offices, bringing back 2,500 employees to help farmers with FSA loans, which finance land, operations and other activities. But the press release made no mention of what would happen to the rural housing programs. "Why did they do this for farmers but not for rural families who need help with the same services?" asked housing advocate and lobbyist Bob Rapoza. The USDA's rural housing service is "an orphan program," said Yentel, the affording housing advocate. "This is not a top priority in that department."